We’d love your help. 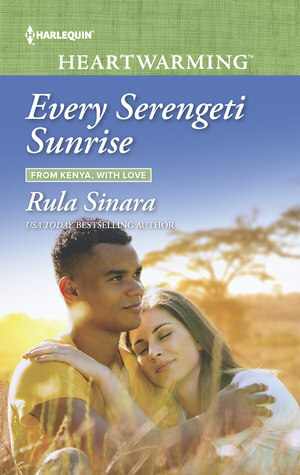 Let us know what’s wrong with this preview of Every Serengeti Sunrise by Rula Sinara. To ask other readers questions about Every Serengeti Sunrise, please sign up. This is my first Rula Sinara book, but it will not be my last! Fun & layered characters. A vividly drawn setting. Engaging writing voice. Witty moments. Heartfelt scenes. Emotional tension. Romantic chemistry. Family. Friendship. All of these things and more make Every Serengeti Sunrise a new fave. While this book can absolutely be read as a standalone, I couldn’t help but notice that these characters seemed to have backstories that had already been told. So I did some digging and discovered This is my first Rula Sinara book, but it will not be my last! Fun & layered characters. A vividly drawn setting. Engaging writing voice. Witty moments. Heartfelt scenes. Emotional tension. Romantic chemistry. Family. Friendship. All of these things and more make Every Serengeti Sunrise a new fave. While this book can absolutely be read as a standalone, I couldn’t help but notice that these characters seemed to have backstories that had already been told. So I did some digging and discovered that I was right. The really cool thing about Every Serengeti Sunrise is that it tells the story of three adult friends – Haki, Maddie, and Pippa – whom readers first met as children in the previous three books of this series. According to the author, this book takes place about 15 years after Through the Storm (book 3). Let me tell you, I am definitely going to be back-reading the first three books after falling in love with this one (and its characters). Sinara writes with such a compelling, warm and witty voice. You can’t help but be immediately drawn into the characters and their story. It’s not long before you are emotionally invested in every facet of the plot, including the doozy of a love triangle and the survival of the wildlife you meet along the way. As a result, your heart is broken just a little bit along with the characters’ hearts, but it’s completely worth the wound. Bottom Line: Every Serengeti Sunrise by Rula Sinara will make you smile, chuckle and – yes – shed a few tears. The characters become your friends, and the Serengeti setting feels like home. For those of us who will probably never venture across the world for the breathtaking experience of life among the giraffes and elephants and lions, we can live vicariously through Haki and Maddie and Pippa while we’re immersed in the pages of their story. Along the way, we also get a taste of important human rights and animal rights issues, as well as a reminder to be the person we were created to be – not someone living solely to meet everyone else’s expectations. A thoroughly enjoyable and engaging story in every way! It is not everyday that a novel set in Kenya pops up in my review feed. Most American authors stick to the US of A, or else some of the more "romantic" countries of Europe. So it was a joy to find something that was a little more unique. And since I had read an anthropological study in college that dealt with Kenya and the tribal laibons, I was excited to see where the author took this story. To begin with, Sinara did a great job of depicting Kenyan culture. She mentioned greetings and gift-givin It is not everyday that a novel set in Kenya pops up in my review feed. Most American authors stick to the US of A, or else some of the more "romantic" countries of Europe. So it was a joy to find something that was a little more unique. And since I had read an anthropological study in college that dealt with Kenya and the tribal laibons, I was excited to see where the author took this story. To begin with, Sinara did a great job of depicting Kenyan culture. She mentioned greetings and gift-giving, all without making these parts of the culture seemed forced to the story or else needlessly exotic. And she included simple details, such as the correct gifts to bring, without stating that those were the expected gifts, creating a sense of normality to the exchange between characters that I appreciated. However, the romance itself felt like something that was forced in between the conflict of farmers killing elephants in retribution for destruction of crops. Though the narrative hints that there were feelings between the two as children, it seems to come out of nowhere that they suddenly love each other so much after only a few days together, days in which they have been on opposing sides of a legal battle. There is also a lot of backstory to the characters that is largely glossed over, which I assume is because it was part of the other three books, which made it difficult to get a sense of just who this cast of characters are as people. Why do any of them have such a drive to protect the elephants? And why does that drive result in Haki being judgemental and sometimes callous to the local tribes people when it comes to their livelihoods? I think that if I had read the rest of the series beforehand, that I would have enjoyed the romance in this one much more. However, reading it as a standalone left me wishing for more when it came to the characters' history and relationship. I have provided an honest review after having received an ecopy through I am a Reader, Not a Writer. This is only my second read from it, but I am loving this series! The unique setting and wealth of well-developed characters in the From Kenya, with Love series make these books so much fun to read--and Maddie and Haki's story is not an exception. Technically, it is a love triangle, a troupe which I'm not usually a huge fan of, but here it worked. Maddie, Haki, and Pippa grew up together in the close-knit community that Ms. Sinara has created, and their families and community relationships have b This is only my second read from it, but I am loving this series! The unique setting and wealth of well-developed characters in the From Kenya, with Love series make these books so much fun to read--and Maddie and Haki's story is not an exception. Technically, it is a love triangle, a troupe which I'm not usually a huge fan of, but here it worked. Maddie, Haki, and Pippa grew up together in the close-knit community that Ms. Sinara has created, and their families and community relationships have been very important to all of them since birth. They all struggle with the conflicts (they perceive) between making their families proud, serving the greater communities, and finding their true calling in life without betraying the first two. Throw in the aforementioned love triangle, and you've got one heck of a heart-wrenching story. There were times when I thought that a HEA would be impossible, but Ms. Sinara brought everyone through to a satisfying--though a little teary--conclusion. Every Serengeti Sunrise takes place several years (fifteen, I think?) after the events of book 3 (Through the Storm), starring characters that were children in the earlier books. Because of this, it both works okay as a standalone and lets readers of the series reconnect with the characters they love further on down the road. Every Serengeti is the fourth book in the From Kenya with Love series by Rula Sinara. This was my first read by Sinara. Overall the book has some very heart felt emotions and can be an emotional roller coaster as we read the story of Maddi, Haki, and Pippa. Three childhood friends. Maddi has been away from her friends for years. When she shows up to support her cause she is shocked to see Haki standing on the other side. As they battle for common ground they also battle a constant pull for each Every Serengeti is the fourth book in the From Kenya with Love series by Rula Sinara. This was my first read by Sinara. Overall the book has some very heart felt emotions and can be an emotional roller coaster as we read the story of Maddi, Haki, and Pippa. Three childhood friends. Maddi has been away from her friends for years. When she shows up to support her cause she is shocked to see Haki standing on the other side. As they battle for common ground they also battle a constant pull for each other in which they can not act upon. Pippa and Haki are set to be married. Part of the From Kenya, with Love, in which Maddie, the lawyer comes back to Kenya to win a case that pits her against her family and her childhood friend, Haki. The sparks that fly between them relate both to their opposition regarding the case and also certain personal issues that involve a third person neither wants to hurt, but they do. How all is resolved, including how to protect the elephants and help the farmers is both interesting and a bit different from other stories involving three pe Part of the From Kenya, with Love, in which Maddie, the lawyer comes back to Kenya to win a case that pits her against her family and her childhood friend, Haki. The sparks that fly between them relate both to their opposition regarding the case and also certain personal issues that involve a third person neither wants to hurt, but they do. There’s still trouble in Kenya with poachers and native villagers killing elephants and leaving orphaned calves behind. The Busara Elephant Research and Rescue Camp provides care to these orphaned, injured young elephants. In book one, we met one of the camp’s operators, Anna Bekker, and her daughter, Pippa, who was four at the time. Pippa is all grown up now, and so is Haki, the son of the Every Serengeti Sunrise is Book 4 in the From Kenya, With Love series, and it has become my new favorite. There’s still trouble in Kenya with poachers and native villagers killing elephants and leaving orphaned calves behind. The Busara Elephant Research and Rescue Camp provides care to these orphaned, injured young elephants. In book one, we met one of the camp’s operators, Anna Bekker, and her daughter, Pippa, who was four at the time. Pippa is all grown up now, and so is Haki, the son of the co-operator of Busara. Pippa and Haki’s relationship seems to have progressed to the next level. The two were always very close since they grew up together at the camp, along with Pippa’s cousin, Maddie, who often visited Busara and who is now a junior lawyer in Philadelphia, PA. Tension arises when Maddie is assigned to the Native Watch Global (NWG) case to defend the native Masai villagers in Kenya, while Haki and Pippa are allies of the Kenyan Wildlife Service (KWS), wildlife conservationists. Busara and it’s advocates are aware of the plight of the Masai farmers who have suffered crop damage and destruction from hungry wildlife, but they don’t believe killing the animals in retaliation is the solution to the problem. The villagers may even be contributing to the illegal ivory trade by selling the elephants’ tusks to poachers in compensation for their losses. "In Every Serengeti Sunrise, the characters are bold, charismatic, daring and definitely not afraid to put themselves in danger. There are returning characters from previous books, and it is recommended to start at the beginning of the From Kenya, with Love series. Rula Sinara brings to life the poaching problem in Kenya and the people who will do everything they can to keep the animals safe from harm" (4 stars @ RT Book Reviews). After a childhood enriched with exotic travels and adventures (both in books and real life), USA Today and Nationally Bestselling author Rula Sinara is now settled in rural Virginia with her husband, three boys and crazy but endearing pets. When she's not writing, she's busy attracting wildlife to her yard, watching romantic movies (despite male protests) or researching trees on her garden wish li After a childhood enriched with exotic travels and adventures (both in books and real life), USA Today and Nationally Bestselling author Rula Sinara is now settled in rural Virginia with her husband, three boys and crazy but endearing pets. When she's not writing, she's busy attracting wildlife to her yard, watching romantic movies (despite male protests) or researching trees on her garden wish list. She's a 2014 National Readers Choice Award winner and double finalist, a 2015 HOLT Medallion Award of Merit winner, a 2015 Golden Quill runner up and a 2015 Book Buyer's Best finalist.